Excited for summer but not too thrilled about hunting for the perfect swimsuit? You're not alone. 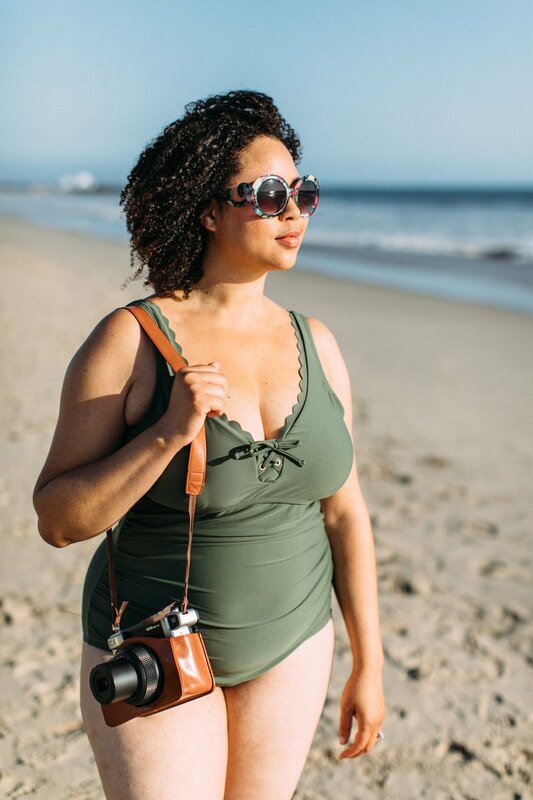 With the blessing and curse of thousands of options, not to mention inconsistent sizing across brands and less-than-ideal fitting room lights, just the thought of a swimsuit-shopping trip might make you shudder. But don't fret. 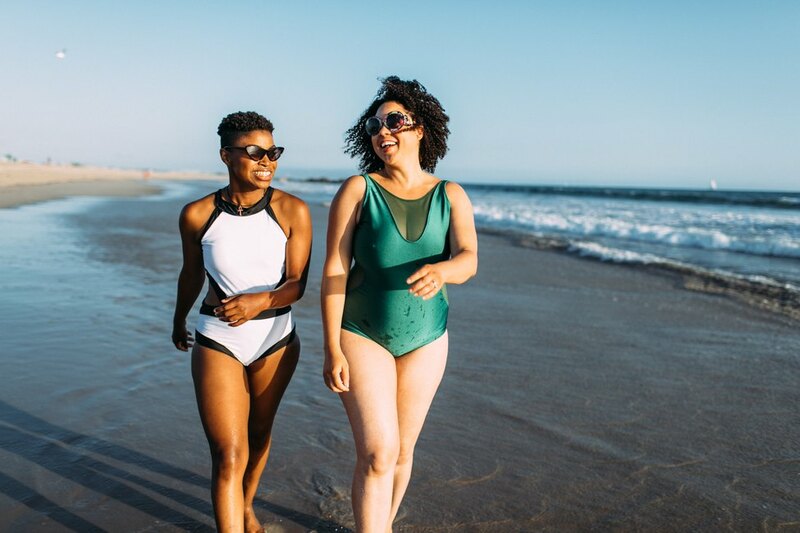 With expert tips and tricks for choosing your best fit, LIVESTRONG's guide to the best bathing suits of 2018 has you covered. Whether you plan on spending your vacation surfing through the days or curling up on the beach next to a good book, we've got the perfect look for whatever summer throws your way. And whether you're in the mood to show off that body or hide behind some extra fabric on those blah days (that's okay, too), there's a suit for you. Just remember: Every body is a bikini (or one-piece, or tankini, or burkini) body! Between bright, patterned looks and subdued hues in interesting silhouettes, brands have been stepping it up when it comes to fitting petites. If it's people watching and lounging in the sand you're after, look no further than a cute print. Wardrobe stylist and image consultant Samantha Brown advises, the scale of the print should mirror the size of the person. Large prints might feel overwhelming on a petite frame, so 5'3" and under ladies might want to consider small prints. 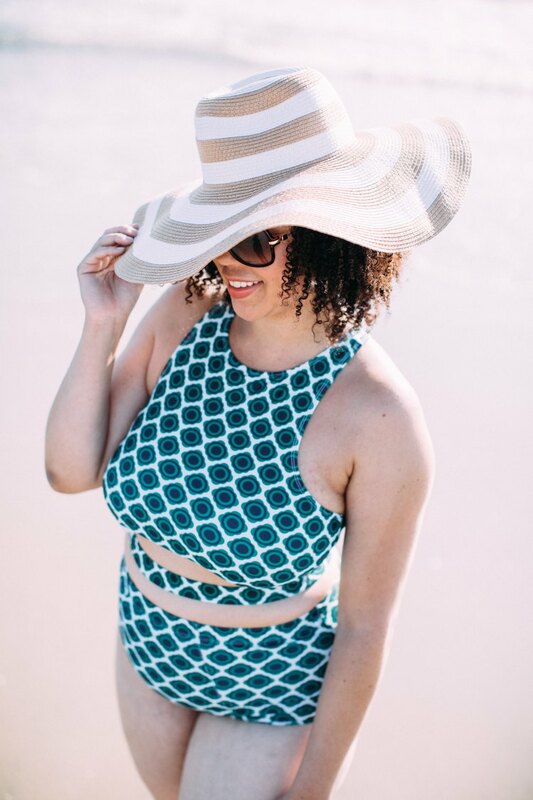 Cleo's two-piece Xhilaration bathing suit (which can be found at Target), mixes prints with trendy off-the-shoulder and criss-cross chest detailing — perfect for your next Instagram post. 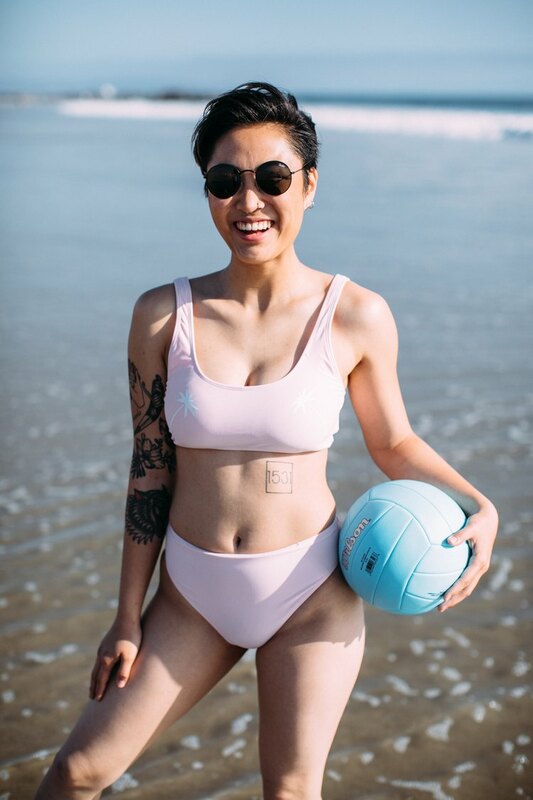 If you're spending the day playing volleyball or surfing, a supportive look that minimizes the chances of a nip slip is perfect. Cleo is rocking Forever 21 separates (which are extremely useful if you have a different size bikini top and bottom). The high-waisted cut showcases and elongates their legs. 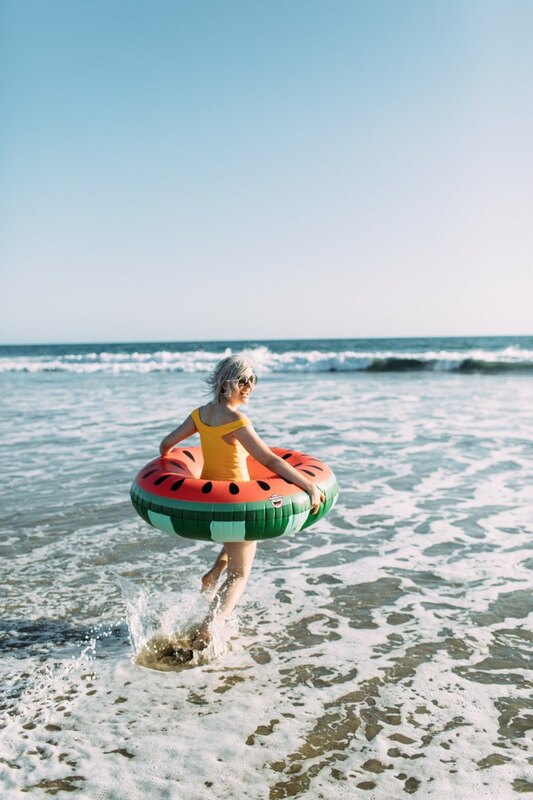 If your version of an active beach day involves simply splashing around by the seashore, a look that's the perfect balance between covered-up and risqué is a great option. 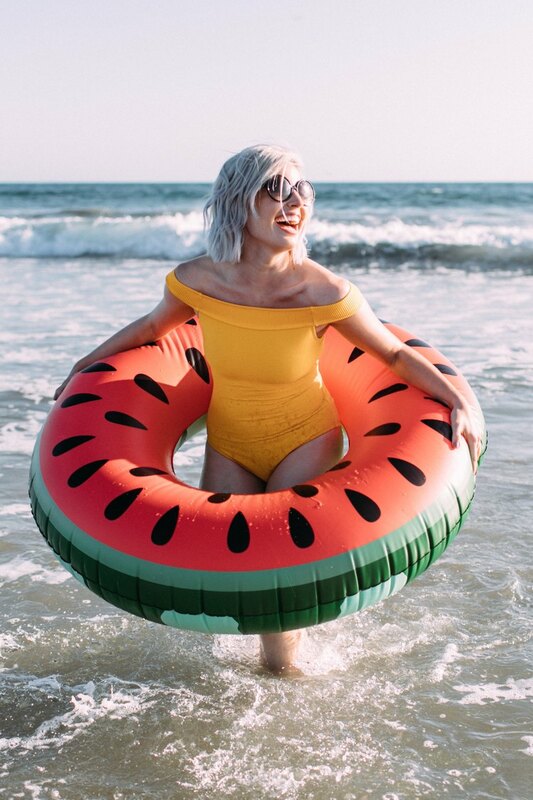 Want to look cute while still ensuring that you won't be left swimsuit-less once that wave hits? Details such as mesh on a trendy one-piece show skin while making sure there aren't any surprising wardrobe malfunctions. For an afternoon of cocktails at the resort bar — no water splashing in sight — a printed look with minimal material showcases your body. The triangle bikini accentuates the bust. Not sure what the day will bring? 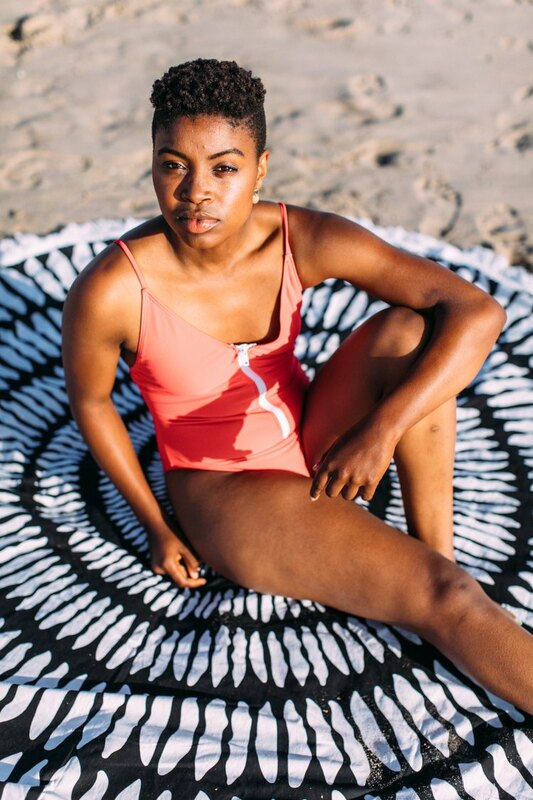 Whether it's yoga on the beach or throwing on a cute cover-up while grabbing a cocktail, this high-cut one piece suit with cute side detailing allows you to seize the day no matter your level of activity. If you're looking for the perfect body-hugging fit, focus on shops that cater to women 5'3" and under. Shops such as Topshop, ASOS and Boohoo have specialty collections that specifically serve all the shorties out there! Though on-trend and universally flattering, the one-shoulder one piece absolutely shines on a tall frame. A monochromatic coral look with waist detailing (like this Hot as Hell number) embraces the body, adding interest to the midsection. About to spend an active day on the beach, but you're more on the market for a girly number than traditional athletic cuts? Not to worry — this Kortni Jeane number has you covered... literally. The high-waisted and crop top style ensures that Christina is able to move stress-free while on her leisurely run. No material tugging involved! Side ruffles add a feminine touch to the suit. For a sureproof way to ensure top half coverage, look no further than the halter style! This style looks amazing on small and large-chested ladies alike and comes in a variety of colors and prints. It draws the eye to the neck and shoulders — perfect for the gazelle who wants to show off her height, or for petite ladies who'd like to appear taller. Cocktails on your mind? Shine at the resort bar in a gorgeous one piece cutout. This head-turning style (which can double as a going-out bodysuit once you're back on dry terrain), creates a curvy shape and steals the scene when placed against the sunset backlight. For a fun-filled day, a secure and colorful off-the-shoulder number will make you feel like a literal ray of sunshine! When playing with color, think about what you're trying to achieve through your look. "Consider the areas you want to highlight and where you typically like to downplay," said stylist Samantha Brown. "Bright and light colors and shine will draw attention, while darker solid colors will detract." As with petite clothing, a great way to ensure your tall frame is being hugged in all the right places is seeking out brands that have collections made specifically for ladies 5'8" and taller: Topshop, ASOS and Boohoo have great fashionable options at affordable price points. 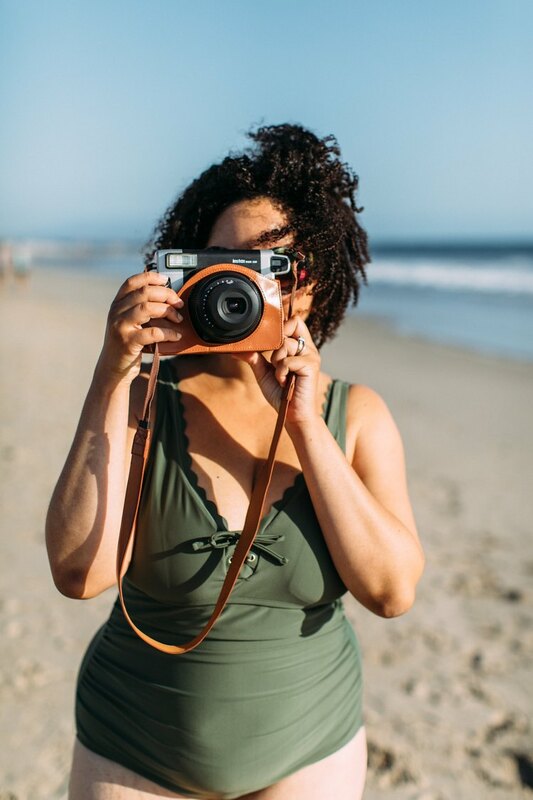 Whether you're people watching or curling up next to a book, a printed one piece is an amazing choice for curvy beauties. It keeps larger breasts secure, while the criss-cross detailing keeps the suit from looking too covered up. 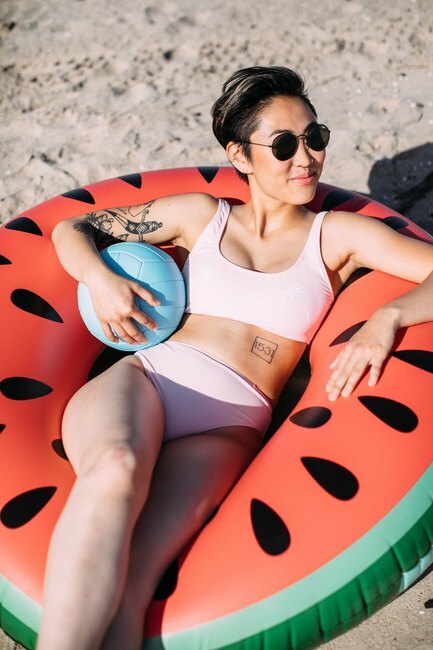 If you're spending the day fueling your surfing habit, a printed high-waisted two piece with a halter style top will give you support while highlighting your figure. According to fashion advisor and Stylist Box co-founder Gail McInnes, halter styles are great options for big-busted babes. Looking for swimsuits in your specific bra cup size will also ensure a better fit. "What you're really looking at when it comes to quality is how it's made," McInnes says. "Inspect the inside of the suit, look at the lining, feel it. Is it soft to the touch? Is it lining the entire suit or only certain areas? Inspect the stitching — is it fine and consistent? Are there any missed or raw edges?" Whatever silhouette you may decide on, one thing is clear: The best bathing suits will be high-quality, with very few, if any, manufacturing flaws. Ready to take a dip? This mesh-featuring one piece makes sure you're in a nip slip-free zone. Not only is the emerald color a compliment magnet, but knowing that this SmartGlamour suit is handmade in the United States with fabric purchased from local small businesses will have any ethical fashion fans smiling. For the after-party, the resort bar is the ideal spot for highlighting your favorite features. According to stylist Brown, an uncomplicated bikini brings attention to the body and highlights the midsection, arms and legs. The string aspect allows for more control over the fit of the suit. Want more curve? Try feminine details such as ruffles. 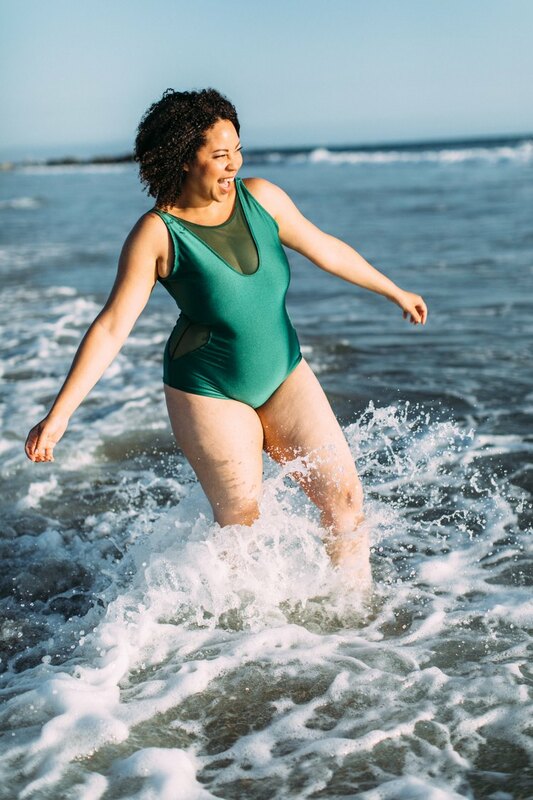 For extended sizes in notice-me looks, check out the Swimsuits for All Ashley Graham and GabiFresh collections. If you're not quite sure what the day will bring, a sturdy one-piece with padding and fun detailing is the safest bet. Scalloped detailing gives of an air of sweetness, but off-the-shoulder or zipper detailing is also sure to gather some compliments. For of-the-moment looks, take a peek at Target. Their extended sizing options currently features 234 options! 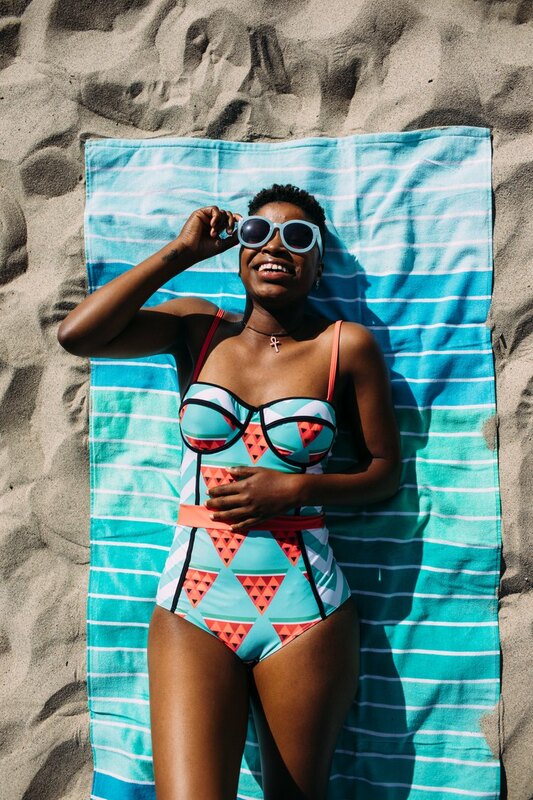 Soak up the sun (and the glances of those dying to compliment this cute number) in a patterned one-piece. Chest and waist detailing compliments the print and adds structure to the look, and the spaghetti straps compliment strong shoulders. For those ladies crushing on prints and retro styles, ModCloth offers some amazing options! 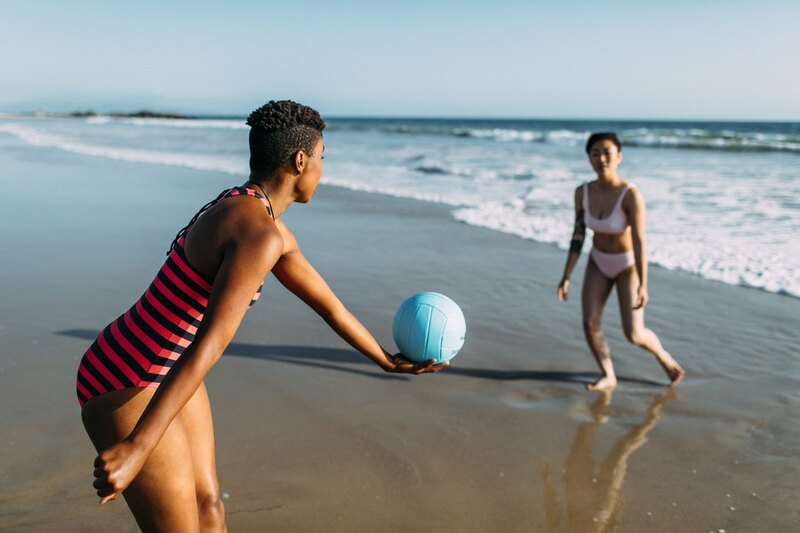 When it comes to beach sports like volleyball and surfing, you might think that fabric plays the biggest role in choosing the best bathing suits. But, as it turns out, the most important thing to focus on is cut — and more coverage is always safer. For something that shows a little more skin, founder of ethical and sustainable clothing line virtue + vice Melanie DiSalvo says, "I would recommend a suit made using ultra-thin neoprene. These suits can sometimes be a little uncomfortable when dry, but in the water they stick to the skin, helping prevent any sporty mishaps." For the less surf-inclined ladies who still want their dose of H2O, a sporty cutout suit should do the trick. This white Boohoo number brings attention to toned obliques while ensuring everything stays in place no matter how many waves take you down. Post-splash, catch happy hour and diffused sunset lighting with a mix-and-match two-piece. A triangle top cut will bring attention to a strong upper body, and string bottom detailing creates a gorgeous silhouette. If you're intrigued about more revealing looks, yet have reservations, focus on choosing a look that feels comfortable. "When trying on bathing suits, be sure the fabric seams are not digging into your skin," says fashion advisor McInnes. "If the elastic is too tight, it will feel uncomfortable after a few hours on the beach and will leave red marks." In addition, wardrobe stylist Brown advises you to take advantage of the 3-way mirror in fitting rooms, and inspect the fit from all angles. Even better? Do a little dance to make sure the suit doesn't shift too much. For the do-it-all athletic babe, a monochromatic Baywatch-like number is both practical and stylish. 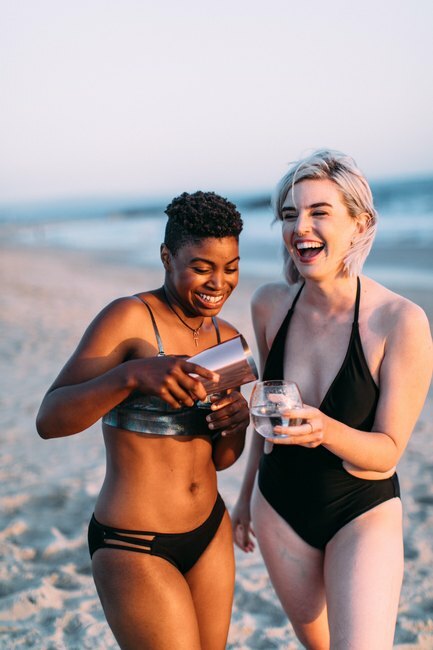 While you're in the fitting room, finding your perfect do-it-all (or what we like to call 'slam dunk') suit, virtue + vice founder DiSalvo recommends looking for suits that advertise body-shaping technology on their tags — or just test it yourself. "If when you pull it, the fabric feels like it wants to snap back, kind of like a rubber band, then it's going to create a great silhouette that hugs your body." And when it comes to fabrics, she suggests polyester and nylon. "They're both wrinkle, stretch and shrink resistant and are considered easy care fabrics," she says. On a budget? Use this trick. If you're looking for the best bathing suits without breaking the bank, it's time to check out the tags on your suit. According to DiSalvo, a "Made in Bali" tag is a great sign. "Bali is famous for its manufacturing of swimsuits, and manufacturers in the country are known for their high-quality standards — even at cheaper price points," she said. Confused about sizing? Here’s how to get started. According to McInnes, a great trick for nailing the sizing is trying on your usual dress size and preparing to size up, as most suits will typically fit better one size larger than the regular dress size. If you're shopping online, prepare to have your bust, underbust, waist, torso, high hip and low hip measurements handy to check against size charts. Most importantly, "always remember that if a bathing suit doesn't fit, its not you, it's the suit," McInnes said. For those relying on online shopping, albeit not an exact science, all hope is not lost. Per Brown, paying attention to the return policy and reviews are important tools when online shopping. If there is a possibility of returning the suit, she advises purchasing two sizes. McInnes agrees, adding that "when in doubt, go up a size." 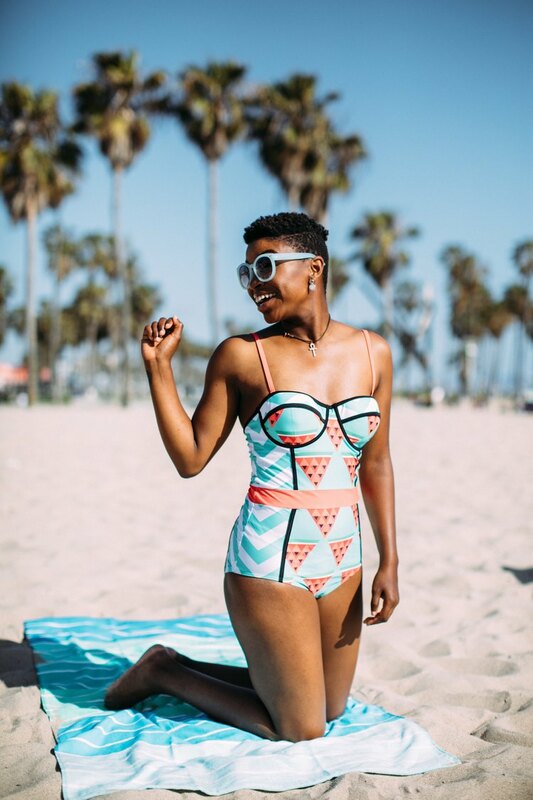 When purchasing a swimsuit, she adds, you should take your measurements while wearing a bathing suit or underwear for a more accurate fit. You’ve found your perfect suit — now what? "Treat it as you would your delicate lingerie," McInnes says. She advises washing it by hand in cool water with mild soap, or simply use baby laundry detergent — making sure you rinse the soap thoroughly before hanging to dry. "And never dry your bathing suit in direct sunlight," she adds. No matter what suit you wear, at the end of the day it's about you — the woman behind it. So step forward in comfort and with confidence, take in the sunshine and radiate brighter than the sun. You deserve a vacation! Ada Ciuca is a writer and associate editor at LIVESTRONG, covering stories on body image, self-love, lifestyle and celebrities. You're probably saying her name wrong. Catch her on Instagram and Twitter @adachooka and see more of her work at adaciuca.com. Scott Clark is a Los Angeles-based lifestyle and documentary photographer specializing in weddings and events. Catch him on Instagram and Twitter @scottclarkphoto and see more of his work at scottclarkphoto.com.